Spring Cleaning Your Life - Personal & Business | Paula Smith Ins. With spring right around the corner, the time is now to make sure that you are ready for it. Not only does this mean gardening and sunbathing and all of those incredible parts about pleasant weather, it also means the practical features. Including the often dreaded spring cleaning. 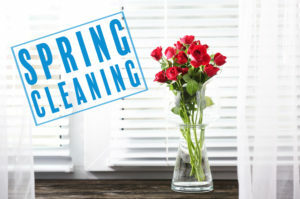 The reality is, spring cleaning doesn’t have to be this massive thing, nor must it happen once a year or at this time, but it’s just a good idea to do. It’s just an excuse to help you focus on those important “must-dos” that just seem to slip under the radar during the winter. Whether it’s a basket full of mending projects, a loose screw on a pot handle, or something else entirely, now is the time to tackle all of those smaller things that just never seem to get done. From small maintenance projects to the more time-consuming mail sorting and more, now is the season to just get it done. No more excuses! Check out this list of some more spring cleaning tasks that may be a little less typical. Whenever there is a change in your life such as marital status or even your address, your insurance policies also need to be updated. Whether that’s the reason to do it, or just taking a look at your policy to make sure that you know what you’ve got available for coverage, this is a huge spring cleaning feature to consider for a calmer life. Leaky faucets, a hole in your garden hose, or a door that just don’t close correctly. It’s all annoying and it all falls under annual maintenance that should be addressed and fixed to keep your home in good shape. Now’s the season to get out there with that hammer – or hire someone who knows what they’re doing – and get that annual maintenance taken care of. Since clutter can make us all cranky, Spring is a great time to deal with it. Put a clutter basket in each room and then fill it with the things that don’t belong in that room. Then take those baskets back up and put their items away in places that they do belong. After that’s done, it might be helpful to put the clutter baskets back in their respective rooms so that this de-cluttering process can happen more regularly and keep your home looking its best. We all know how picking up one thing and taking to another room gets distracting and turns into a rabbit hole. This way, putting a basket in the room we are working on keeps up focused on that room and on task. Spring cleaning doesn’t have to be a huge thing, but it can make a really noticeable difference to your overall quality of life and home. Take the time to do it right and you’ll be able to reap the benefits of it. Everyone’s to-do list may look different, but that final moment of relief will be the same. Contact Paula Smith Insurance for your annual insurance review or if you don’t have a relationship with your insurance agent and want one, we would be happy to be that insurance resource for you. Call us at (281) 488-8880 today.